Sony brings 'floating touch' navigation to the Xperia sola | What Hi-Fi? All you have to do is hover your finger above the screen so it acts like a moving cursor without making contact with the screen itself. The feature will be further enhanced with future updates. The Xperia sola also features NFC (Near Field Communication) Xperia SmartTags, enabling you to change the smartphone's settings in an instant. By touching a NFC Android smartphone on a SmartTag, a pre-configured profile in the phone will launch. Two SmartTags are included as standard with the phone, and can be personalised with up to ten commands. Out of the box, one is pre-programmed for the living room – to turn on wi-fi and launch Google news and weather apps – the other for the bedroom, to turn on the built-in alarm and switch to silent mode. In addition, Xperia sola supports NFC pairing so owners can share apps and services by tapping their phones together. Other tech highlights include a 3.7in Reality display with Mobile Bravia engine, a 1GHz dual-core processor, xLoud and 3D surround sound, plus direct access to the Sony Home Entertainment Network via Video and Music Unlimited apps. 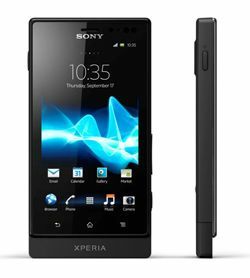 You'll be able to buy the Sony Xperia sola in black, white or red in the second quarter of this year. Initially it will run Android 2.3, but will be upgraded to Android 4.0 (Ice Cream Sandwich) in summer 2012.